St. Charles Church - just a few hundred meters located from the place Mozart died - is one of the most impressing and significant buildings of Vienna. Every saturday between march and december 4th it is the ideal location to perform Mozart´s last work - the REQUIEM. The concerts are performed by Choir and Soloists of Salzburg Concert Society as well as Orchestra 1756 (on period instruments). All together there are more than 40 musicians on stage. The orchestra 1756 plays on period instruments. In Vienna you can not experience Mozart and his surrounding mystique more authenticly, more profoundly or more typically. 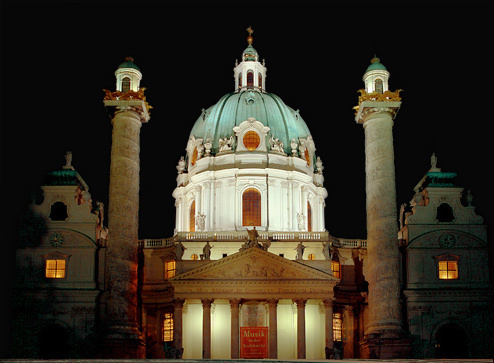 Karlskirche (St. Charles's Church) is a baroque church located on the south side of Karlsplatz in Vienna, Austria. Widely considered the most outstanding baroque church in Vienna, as well as one of the city's greatest buildings, Karlskirche is dedicated to Saint Charles Borromeo, one of the great reformers of the sixteenth century.